Nestled on the shores of its namesake lake in the North Island’s idyllic Bay of Plenty region, Rotorua is known for its stunning scenery and geothermal activity. Think geysers and natural hot mud pools! From walking tours around the plentiful lakes of the region, to stunning mountain biking trails, there is an activity to suit any adventurous traveller. As well as a strong sense of adventure, the city also has fascinating Māori heritage. Originally settled in the 14th century, Rotorua is a cultural hotspot and a must for anyone wishing to experience authentic Māori culture. With so much on offer, deciding where to go first on your Rotorua holiday could be the most difficult part of your trip, so we’ve come up with three unmissable options for you to start with. The world-famous Whakarewarewa Forest is home to over 130km of stunning mountain bike trails, weaving their way through the tallest trees in New Zealand; Californian redwoods. 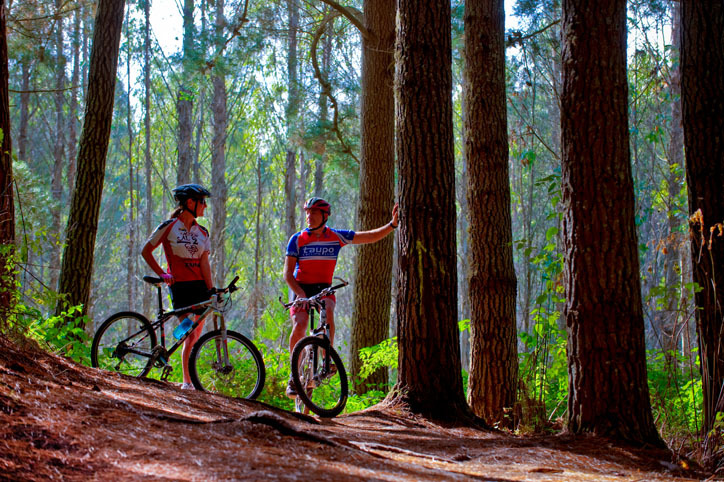 Just a short 5km journey from Rotorua city, these giant trees grow in excess of 70 metres tall and provide a breathtaking backdrop for a day riding the bike trails. Trails are graded by difficulty and there are a wealth of options for novices right through to experts to experience some of the world’s top-rated mountain bike trails. Prefer to take your time to take in the sights? A walk amongst these inspirational trees will fit the bill. Suspended in the canopy of the forest you can get a truly unique experience from the Redwoods Treewalk; walk un-aided (no harnesses or safety gear required) on the network of suspension bridges coursing through 553m of unique forest views. It’s even open after dark, when the canopy of trees and ferns are artfully lit in a design by renowned New Zealand designer David Trubridge to provide an unforgettable viewing experience. 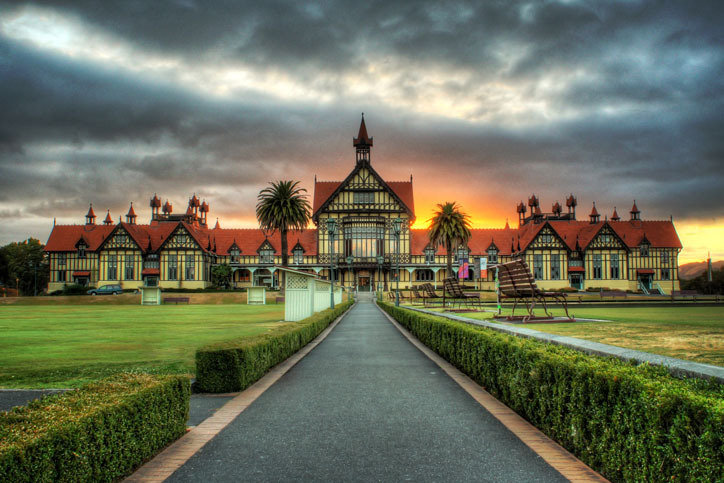 Perhaps Rotorua’s most famous attractions and some of the most iconic sights in New Zealand are the natural geysers and geothermal mud pools. Take a short trip out of town to watch one of the spectacular daily eruptions – the Pōhutu geyser at Te Puia is the largest in the Southern Hemisphere and its hourly eruptions can reach 30 metres in height. 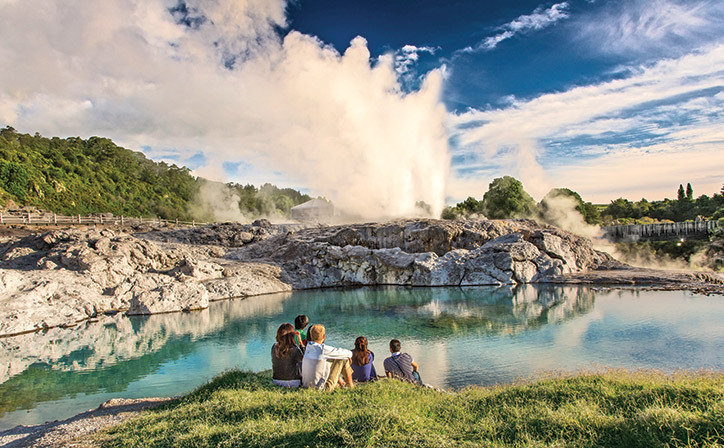 Immerse yourself in the rich history of this volcanic region as you walk through parks dotted with bubbling mud pools, hot waterfalls and steam holes. The best part? They’re right on your doorstep, leaving you time to continue your adventure or head home to watch the sunset over the lake. 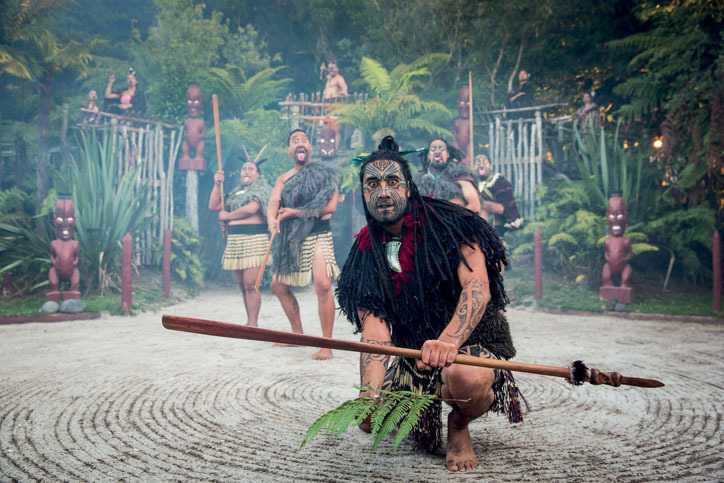 Enjoy an authentic Rotorua experience by immersing yourself in the Maori culture that permeates the local architecture and community. Visit the buried village at Te Wairoa, buried under the ash and mud of a volcanic eruption from Mount Tawarewa in 1886. An on-site museum provides the full history of the village, and you can walk the archaeological site and follow trails that lead to picturesque waterfalls hidden amongst the native bush. At Whakarewarewa living Māori village, take in an authentic rendition of the famous Haka and sample the delights of a geothermally cooked Hangi meal; where the food is buried in hessian sacks to slow cook over heated volcanic rocks. The perfect way to cap off your Rotorua experience. Ready plan your Rotorua Adventure? Speak to one of our Relaxing Journeys specialists today!